The Alfa Romeo MiTo, due to launch in all the major markets in stages from July, marks an additional step forward in the brand's stylistic, historical and technological identity: for nearly one century, Alfa Romeo has stood as an indisputable symbol of motoring design and Italian sporting style, as well as a towering example of engineering and mechanical excellence. These, in a nutshell, are the distinctive features of the 'sportiest mini'. Alfa Romeo MiTo. The Mi.To is the first car to be built since the 8C Competizione – Alfa Romeo’s icon of style and technology, from which it borrows certain characteristic traits: The particular shape of the side windows described by the flush windows, the three-lobed motif that distinguishes the front bumper, the shape of the headlights and the LED tail-lights. The headlight and tail-light surrounds represent a distinctive personalised feature : A frame featuring different forms of material processing and colours to create an ultra-stylish eye-liner effect that underscores the cars style and aggression. The highly distinctive dashboard and seats ensure that the interior of the Alfa Romeo MiTo represents the ultimate expression of Italian style, welcoming yet sporty, with high material quality and scrupulous attention to detail. The greatest thought has also gone into defining the dimensions, which add up to a compact and dynamic shape that nicely fulfils the requirement for downsizing, one of the buzzwords of present-day motoring design. This trend naturally does not concern only the car's engines but also its weights and dimensions. Downsizing actually means improving energy efficiency, reducing CO2 emissions and simplifying driving and parking around town. But this new approach to construction does not preclude sportiness. Quite the opposite: the Alfa Romeo MiTo is the best demonstration that the two requirements can be reconciled. First of all, the car’s compact size and the use of special steels mean that it has been possible to achieve outstanding torsional stiffness (101.200 daNm/rad): this is an essential quality to ensure that the car’s response is always prompt and accurate. The car’s proportions also make a very clear statement that this is a true sports car – it measures 4.06 metres long, 1.44 metres high and 1,72 metres wide – without giving up anything in terms of driving comfort. Indeed the excellent interior space distribution makes for an outstanding amount of room for both driver and passengers. The Alfa Romeo MiTo is therefore a strong, compact car with dominion of the road and an emphatic personality of its own. This is also borne out by a high waist line – the ratio between body and glass is typical of an Alfa Romeo – and above all a long, very aerodynamic profile (Cd 0.29) that, together with a wide track (1.483 mm), add up to a vice-like grip on the road. Not to mention the fact that the broad tyre tread ensures the best print on the ground under all conditions. Style, design, and more: performance and technology must always be top of the range on an Alfa Romeo. Apart from anything else, an Alfa Romeo has always made its personality known at the steering wheel, one of its slogans being ‘movement and agility’. And the Alfa MiTo is certainly no exception: the new model display all the unmistakeable hallmarks of unrivalled driving satisfaction, Alfa Romeo style: beginning with a favourable weight/power ratio (more than one third higher than the average for the segment); plus a centre of gravity near to the roll axis for the best dynamic response - and concluding with mechanical units that can accommodate even sudden movements in safety. The new Alfa Romeo MiTo is therefore self-avowedly an Alfa to the core, confirming an uncompromising sense of control and driving satisfaction. This out-and-out sporty configuration is also determined by a low ride typical of a true Alfa Romeo and the choice of two tried and tested suspension layouts – MacPherson at the front and semi-independent with torsion beam at the rear – already used on other Fiat Group Automobiles models but appropriately revised and updated to meet the handling targets that customers perennially expect of an Alfa Romeo car. As a standard feature on all specifications and engines, for example, the Alfa Romeo MiTo are fitted with shock absorbers with coilover springs that considerably reduce roll. Hence a greater capacity to absorb road roughness; maximum linearity and precision in the steering response (the steering ratio – 12.9:1 – is extremely direct and the trajectories very neutral); and great road-holding, maximum stability in high-speed manoeuvres and the agility of a true Alfa Romeo over tight mixed routes. Not to mention the fact that the four generous disc brakes guarantee an excellent stopping distance: 34 metres from 100 to 0 km/h. So much for the mechanical options that make the Alfa Romeo MiTo an uncompromising sports car. These features are complemented by the latest new products in the field of electronics. Beginning with the brand new ‘Alfa D.N.A.’ device that the compact Alfa Romeo introduces for the first time in its sector. This control acts on the engine, brakes, steering, suspension and gearbox, allowing three different vehicle behaviour modes based on the driving style best suited to the situation or the customer’s wishes: supersporting (Dynamic), town driving (Normal), maximum safety even in difficult grip conditions (All weather). Another innovative product introduced on the Alfa Romeo MiTo is the Q2 Electronic system that acts only on the brakes to guarantee the effect of a self-locking differential. On normal cars, the inner wheel loses grip and the trajectory swings wide when the car accelerates out of a bend. with the Q2 Electronic system on the other hand, the traction control device brakes the inner wheel and redistributes the torque, applying it to the outer wheel with the greatest grip. This maintains the desired trajectory with optimum traction: with this system, lateral acceleration rises to 1 g as opposed to the value of 0.95 g obtained without the Q2 Electronic. Lastly, the Alfa Romeo MiTo adopts another state-of-the-art electronic device for maximum handling: the DST (Dynamic Steering Torque) system that complements the electronic power steering as part of the Vehicle Dynamic Control system. In detail, the DST makes it possible to apply a slight torque to the steering to suggest the correct manoeuvre to the driver. This takes place in very specific circumstances, e.g. to compensate for oversteer or to make the effort at the steering wheel proportional to the steering angle, or to maintain a trajectory if the grip is different on either side. Driving satisfaction means also being able to count on lively and reliable power units. 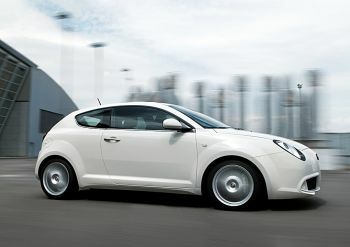 Those provided with the Alfa MiTo are state-of-the-art as far as automotive engineering is concerned in terms of technology, performance and respect for the environment. The engines available at launch will be the 155 bhp 1.4 Turbopetrol, 120 bhp 1.6 JTDM and an aspirated 1.4 engine of limited power (78 bhp) for those who have recently passed their tests. Each with different qualities, all utilised to the full due to pairing with 6 speed manual gearboxes that are individually remarkable for their generosity and lively temperament and also for their high performance and sophisticated technology. In particular, the 120 bhp 1.6 JTDM is the best engine in its category in terms of specific power (it can achieve a mighty torque of 320 Nm at just 1750 rpm), while also boasting 80% lower particulate emissions and 20% lower CO2 emissions than previous generation power units. In the same way, the top of the range car in terms of power – the 155 bhp 1.4 turbopetrol – offers extraordinary performance for this capacity (top speed of 215 km/h and acceleration from 0 to 100 km/h in just 8.0 seconds) with a 30% reduction in fuel consumption and CO2 emissions compared to cars of the previous generation. Not to mention the fact that Alfa Romeo power units may be distinguished by their unmistakable sound that emphasises the unique nature of the car while complying fully with type approval constraints and environmental aspects. At a later stage, the Alfa Romeo MiTo engine range will be further extended to include higher power ratings and the introduction of other new features such as the Multiair electronically controlled valve lift system and the innovative DDCT (double clutch) automatic transmission. Multiair technology is an innovative electronic intake valve control system that meters the air delivered to the chamber during each combustion cycle without having to use a conventional throttle valve, significantly cutting fuel consumption, improving engine response, and making the car more fun to drive. The secret behind the Multair system is a small oil chamber located between the cam and the intake valve: the volume of oil in this camber can by varied by means of an on-off solenoid valve managed by an electronic control unit. In this way, the cam lift profile can be varied steplessly to match changing engine air demand. Conceptually, the DDCT Dual Dry Clutch Transmission consists of two transmissions in parallel, each with its own clutch. This makes it possible to select and engage a gear while the other transmission continues to transit drive via another gear. Gear shifts are thus accomplished by gradually switching between the two clutches, ensuring constant torque delivery and traction. The result: peerless driving comfort and responsive handling that far exceeds anything conventional automatic transmissions can offer, combined with higher efficiency and fuel economy. The Alfa Romeo MiTo was built to obtain the maximum Euro NCAP rating in the future. For this reason, the new model unveils the most sophisticated electronic devices for control of vehicle dynamic safety: Vehicle Dynamic Control (not disengagable) that manages important functions such as the Hill Holder, traction control, assisted panic braking, MSR to prevent the wheels locking during over-run, DST (Dynamic Steering Torque) and Q2 Electronic. All these systems guarantee both driving safety and vehicle traction - hence performance. The Alfa Romeo MiTo also offers total protection for driver and passengers, as evidenced by 7 airbags as standard (two of which Multistage); three-point seatbelts with pretensioners and load limit limiters; S.A.H.R. (Self Aligning Head Restraint) system, an anti whiplash device built into the backrest on the front seats. Not to mention the contribution to occupant protection made by the body, the bonnet, the doors and the dashboard crossmember in addition to the seats and steering column, that have been designed with a view to their behaviour in the event of an accident. In the field of preventive safety, the Alfa Romeo MiTo also offers headlights with a daytime function (known as daytime running lights) that automatically turns on the side lights when the engine is turned on – to meet a specific standard that will enter into force in 2012 – and LED tail-lights that offer greater brightness than conventional bulbs for more safety. 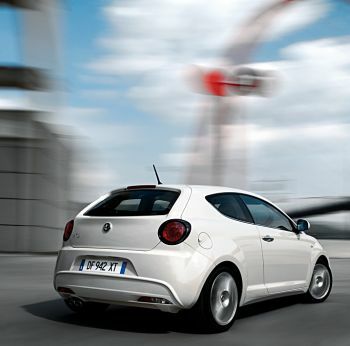 The Alfa Romeo MiTo is also a distillate of technological innovation when it comes to on-board well-being. The new car is also able to offer the most advanced devices and systems in the in-car entertainment field due to its cooperation with the very best partners in each sector. For example, you can experience the musical lift of a radio with CD—MP3 player or, as an option, steering wheel controls and a Bose® Hi-fi. Or you can access the countless functions of the Blue&Me® device, a system developed in conjunction with Microsoft that offers handsfree operation with a Bluetooth® interface and advanced voice recognition, USB port, MP3 player and SMS interpreter, also available on the MiTo in the two latest versions, i.e. NAV (with pictogram navigation systems) and MAP (with a navigation system on a remote display applied to a special port on the dashboard). Lastly, a dual zone automatic climate control system and in the future a panoramic sun-roof of ample proportions contribute to the satisfaction of travelling on board the Alfa Romeo MiTo. The Alfa Romeo MiTo is designed for and demanding customers who love to stand out in a crowd and offers two specification levels (Progression and Distinctive); two special Packs (Sport and Premium); 7 different seat trims plus upholstery in top quality ‘Pelle Frau’ leather; 2 Progression interior colours with Sprint dashboard; 3 interior colours with Competizione dashboard; 2 seat colours for the Sport Pack; 3 ‘Pelle Frau’ colours complete the range of interiors. Five types of alloys are also available (from 16’ to 18’) and 10 body shades, of which 5 metallic, that reflects every facet of the sporting soul of the new Alfa Romeo (no fewer than 6 colours have been introduced for the first time on the Alfa Romeo MiTo). These are then combined with 2 non-standard colours for the taillight and headlight frames (in addition to the specific Progression and Distinctive colours) and the frames may also be body-coloured as an option This broad and diverse range confirms the unique nature of the new model. Fiat Group Automobiles Financial Services, a captive finance company set up as a joint venture in partnership with Crédit Agricole, has chosen to support the sale of the Alfa Romeo MiTo with very different financial products that share a single goal: making it possible to buy into the new Alfa Romeo dream, the most compact sports car ever.